K. Claire MacDonald’s work is based on an interdisciplinary approach that seeks to combine her painting and metalsmithing practices. Fueled by the desire to merge these two disciplines, she works with a variety of materials and techniques, and explores how they can be manipulated and combined. Originally from Nova Scotia, Claire is presently based in Toronto, Ontario where she is working as an artist-in-residence at Harbourfront Centre. Yuliya’s work is based on experimentation and process driven practice. Her silver, gold and brass pieces are inspired by nature and everyday objects. She likes to engage the viewer. Yuliya’s jewelry reflects her focus on elegant form and shape with a playful element of color. Christine Bossler is a metalsmith who was born, raised and lives in Detroit, MI. Christine has worked with metal since high school and college, and started her own studio practice in 2005. 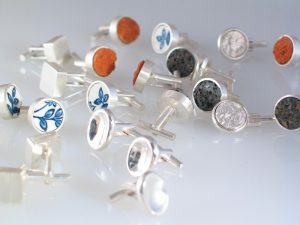 Christine enjoys making all sorts of work from wedding sets and cuff links to outrageous one of a kind pieces for the runway and community art projects. Whatever Christine is making, a sense of clean design and a love for material and texture are always present. When Christine is not working in the studio, she can usually be found working in her 1920’s home or out walking her dog (Basil) along the Detroit River. Emily Gill is a Toronto-based designer, native to Montreal, Quebec. 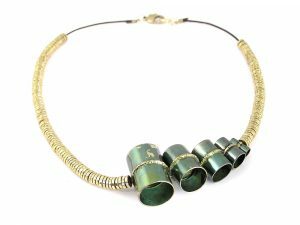 She specializes in contemporary jewelry stemming from oceanic and biological inspiration – an obsession since childhood. Her jewelry presents handmade metal jewelry as alive and dynamic, worn as a playful symbol of constant growth, beauty, and elation. 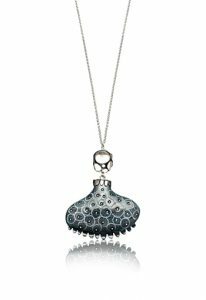 From lost wax casting in silver, hand cut sheet metal and fused glass enamel over organic shapes – Emily’s jewelry is a frolicsome product of material and imagination combined. The jewelry that Rachel will be showing at this year’s SNAG Trunk Show combines hand-work with 3D printed technologies, making her quirky and vibrant jewelry accessible, wearable and affordable. Admittedly, Rachel’s production work is a guilty pleasure for her to make. It allows Rachel to set aside the heavier concepts that she employs in her larger works and is instead inspired by outlandish hip-hop chains and candy-jewelry. The clusters of bright, poppy colors intermingled with faux gold is a combination that creates jewelry with a pulse.